Gladiolus flowers bloom on a long spike that ranges from 2 to 4 feet tall. These attractive flowers open from the bottom and work their way upwards creating a long spire of blooms. They create an impressive backdrop in flowerbeds, but are often grown in cutting gardens to use in floral displays. The grass-like foliage resembles the blade of a sword giving these flowers a reputation as sword flowers. The blooms range in color from bold orange and red to pastel blues, pinks and yellows with many outstanding bi-colors.flowerbeds, but are often grown in cutting gardens to use in floral displays. The grass-like foliage resembles the blade of a sword giving these flowers a reputation as sword flowers. The blooms range in color from bold orange and red to pastel blues, pinks and yellows with many outstanding bi-colors. 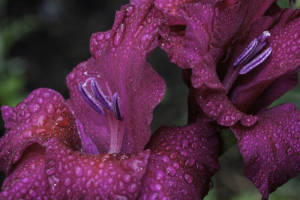 What Does the Gladiolus Flower Mean? Gladiolus is both the scientific and common name for these flowers. They are sometimes referred to a sword flowers or sword lilies due to the sword-like shape of both the foliage and the flower spike. The flower spire is said to pierce the heart of the recipient with love. 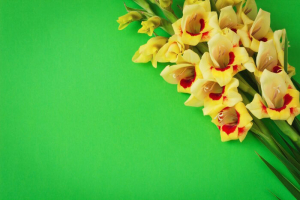 The ancient name for gladiolus was xiphium from the Greek word xiphos, meaning sword. 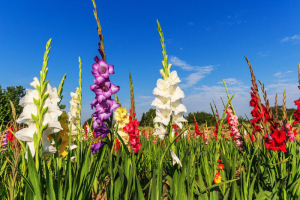 Its name was later changed to gladiolus, which comes from the Latin word gladius, which also means sword. Gladioli were considered the flower of the gladiators and have long been associated with swords. These stately flowers are used in floral displays at special celebrations and are a favorite in country gardens. 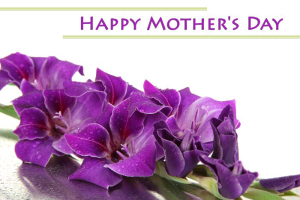 They are considered old-fashioned flowers, as early American women often planted these flowers at the backs of their flower gardens to create a colorful backdrop to the flowerbed. They were also commonly planted along fences or the foundation of the home, as the tall spires need support to keep them upright. The genus gladiolus includes 260 species with 10,000 registered cultivars that come in the colors of the rainbow. Individual blooms may be a solid color or bi-colors and run the gamut of shades of pink, red, purple, yellow, orange, white and even green. Most gladioli originated in Africa and Asia and were not known in Europe until between 1739 and 1745 when they were introduced by travelers following the Indian Trade Route. 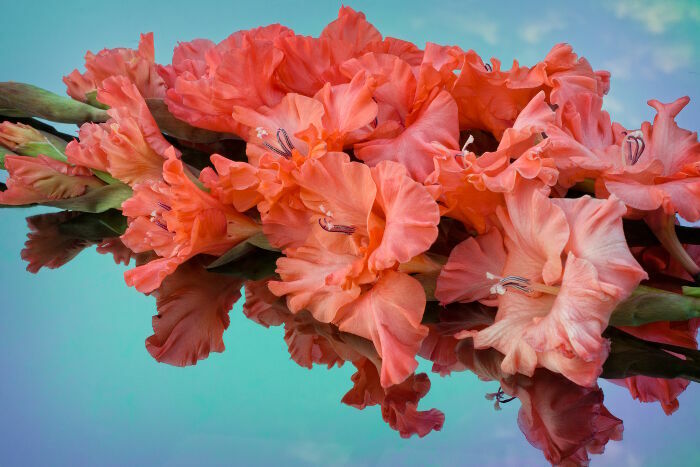 European botanists and hobbyist soon began to grow and breed gladiolus flowers. By 1806, William Herbert produced the first hybrid. 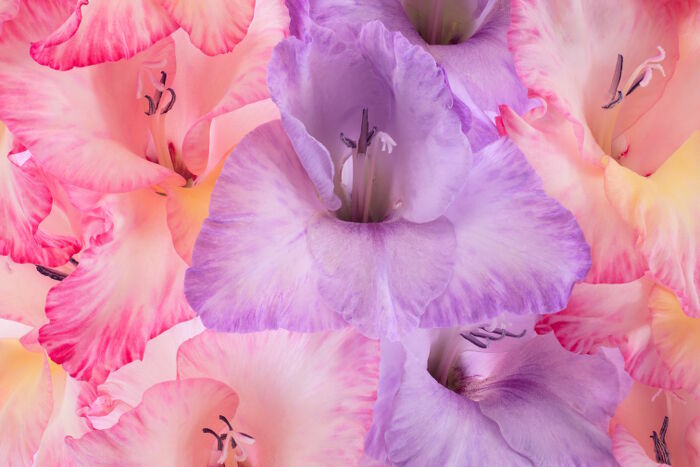 By 1840 and 1850, hundreds of varieties of gladiolus had been bred. The plural of gladiolus is either gladioli or gladioluses, depending on regional preferences for the term. 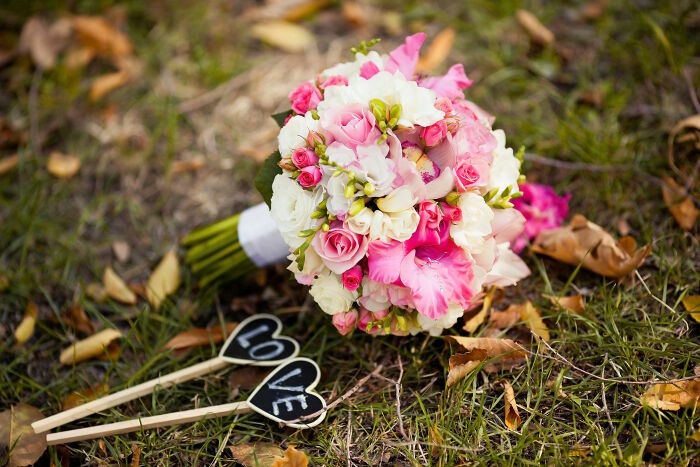 Modern gladiolus flowers are affectionately referred to as glads. Whether it is a shortening of their name or an expression of how these flowers make you feel is up for interpretation. 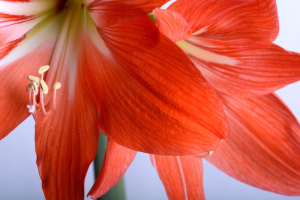 Some believe that biblical references to the lilies of the field refer to gladiolus, which grew wild in the region. There is no specific meaning attributed to gladiolus flowers of particular colors.They are simply seen as a symbol of fond remembrance and honor and are often included in funeral sprays for this reason. 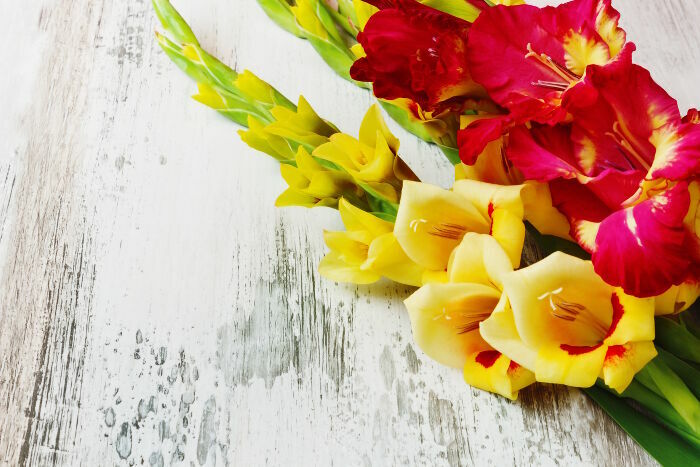 Traditional meanings of flower colors may be applied to gladiolus to give them special meaning to the recipient. The English used the powdered roots of the British and Mediterranean gladiolus to make a poultice for wounds. It was thought to draw out splinters and thorns. Powdered corms of these gladioli were also mixed with goat’s milk to treat colic in babies, but beware. Many gladiolus roots are poisonous and can even cause skin rashes if the corms are nicked or bruised. Modern African herbalists consider gladiolus a powerful healing herb that is used to treat colds, dysentery, diarrhea and constipation. It is also thought to boost low energy and to promote regular bowel movements. One species of gladiolus (Gladiolus dalenii ) provides a source of food in the Congo. The underground corm is boiled and leached in water to remove toxins. It provides a good source of carbohydrates to the diet. 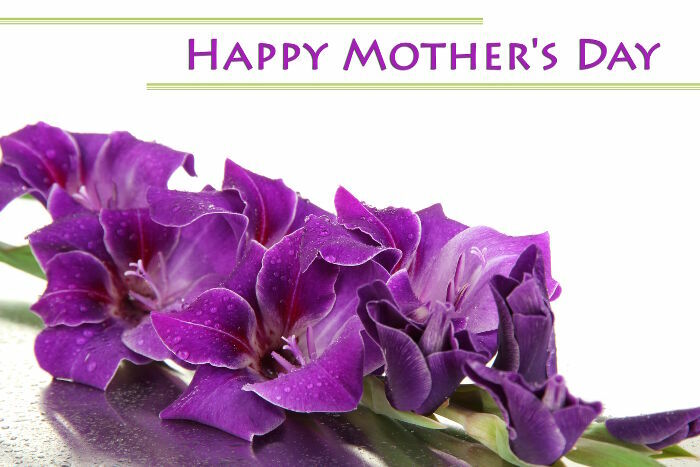 The gladiolus flower’s message may vary, but it will never be ignored. This bold beauty captures the heart and soul like no others with its impressive spire of flowers. 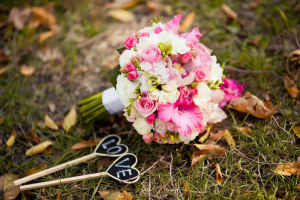 Whether you choose a floral arrangement with similar colored gladioli or you prefer a rainbow of colors to impress your love, there is a gladiolus color for nearly every occasion. She is so beautiful I am in love with her. I gave her white and purple flowers. I want to marry her! I really like this flower and really happy and al-shukraia to the God or Allah hu kabar for the beauty of creatures in the world. Thank you.